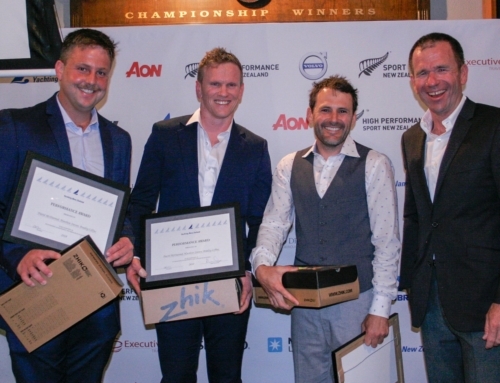 The 2016 Maersk Line 18′ Skiff ANZAC Championship kicked off today at the Royal Akarana Yacht Club with the Kiwis going up against the Aussies on the Waitemata Harbour in Auckland. 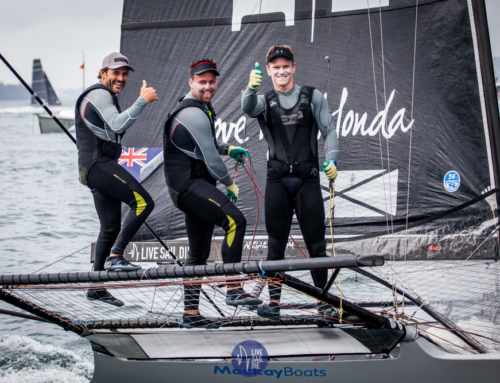 Yamaha (AUS) was one of the early favourites for this regatta and they didn’t disappoint with Dave McDiarmid, Matt Stevens and Brad Collins leading the the fleet after two races. They finished day one with a gun in race one and second in race two. Thurlow Fisher Lawyers (AUS), Michael Coxon, Dave O’Connor and Trent Barnabas, trail behind in second place with a third in race one and the gun in race two. Michael Coxon, skipper of Thurlow Fisher Lawyers had a little more to say. “What a great day! Great wind, great atmosphere, great conditions, it was all great. 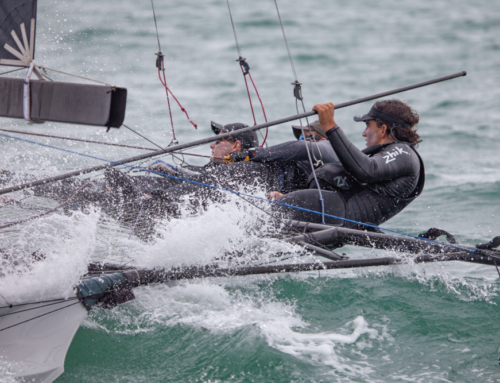 Nickolas Daly, John Wolton, Steven Tomes on Peroni (AUS) are currently third after day one with a second and a fourth. “It got a bit dark out there this afternoon!” said Daly. Seems these two skippers are keeping their cards closed considering it’s still very early days. Racing continues tomorrow at 1300 hours with three races scheduled.